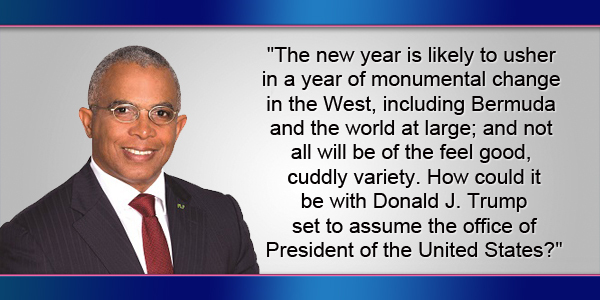 The new year is likely to usher in a year of monumental change in the West, including Bermuda and the world at large; and not all will be of the feel good, cuddly variety. How could it be with Donald J. Trump set to assume the office of President of the United States? Consider this, a man who remains temperamentally unfit to be President of the United States by a long shot, promises to author the kind of disruption to the US and global order, the likes of which we have not seen in close to four decades. As was the case in Bermuda in 2012, Trump’s election in part, has been described as a “white-lash”, a re-emergence of a type of white identity politics that rears its destructive head from time to time. This time characterized by an ethno-nationalist reaction to globalism abroad and the unsettling march of demography and multiculturalism at home. Despite this, the American economy under President Obama is starting to rebound significantly. A recent United States census report released before the election revealed that median household income increased by $2800.00 in 2015, a 5.2 per cent rise. It also chronicled the largest decrease in poverty since 1968, a not inconsiderate achievement. And finally, that the jobless rate was down to 4.6 per cent, with economic growth spiking by 3.5 per cent in the third quarter or 2016. In other words, whatever was motivating Trump’s supporters to vote for him surely had as much to do with other factors; as it did with the actual performance of the real economy. In relation to Bermuda, Trump and his Republican colleagues in the Congress, potentially represent an existential threat to our economy, as he has promised to radically reduce the US corporate tax burden from around an estimated 35% to 15-20%. If he and the Republican-controlled Congress do achieve the above over the next 12 months or some semblance of the above, it will have the effect of significantly undermining our global competitiveness and attractiveness as an offshore centre. Under this scenario, we could very well see that outcome because such a reduction in the corporate rates would sharply reduce the rationale of American owned companies and others within the offshore insurance and risk management sector to remain in Bermuda or in future to set up shop here. While our low to no tax advantage is not our only trump card, it is in the top three along with our regulatory regime. For a lot of Americans, Trump’s election slogan, “Let’s Make America Great Again” was nothing more than a very loud racist dog whistle that in translation really meant: let’s make America white again. Although the racial dynamics are a little different, one could make a similar case that what, in part, drove the recent vote in favour of the United Kingdom leaving the European Union was the same atavistic and ultimately tribal and nationalistic impulses that were so evident during the recent American election. As to implications for Brexit on Bermuda, the decision on the part of the UK government to pursue Brexit and leave the European Union, while perhaps threatening the ability with those of us with British passports to freely access the EU, could very likely represent an economic advantage for us. This could occur by the decision of UK based insurance, reinsurance and other risk management related service providers to consider domiciling here in order to take advantage of the passporting benefits that Bermuda gained by the granting of Solvency II status with the EU. The fear on their part, is that a so called “hard Brexit” from the EU could jeopardize the UK domiciles continued unfettered access to EU markets. The acquisition of the Solvency II agreement began under the previous Progressive Labour Party Government and represents a significant achievement that may pay off in ways that could not have been predicted even a year ago. In other words, what Trump potentially taketh away; Brexit may provide. Trump’s electoral success was also indicative of a repudiation of the current global trade order and the agreements and treaties that undergird it. But perhaps we should not be too surprised as to the outcome of the US Presidential election – no matter how distasteful and that may be putting it mildly. The man, in essence, met the moment. Although it is not an exact parallel with what has taken place in the US or for that matter the UK, the pronounced growth of income inequality in Bermuda is a reality that we can no longer ignore. Certainly, it is fueling racial disparities in Bermuda along with an increase in real poverty as the relevant statistics confirm. All of this was exacerbated by the great recession and its aftermath. This trend was also powerfully reinforced by the election of the OBA in 2012 which represents the concentrated political power of Bermuda’s economic elites. Is it any wonder then why ongoing political instability and emerging labour unrest are now the order of the day? This should be a wakeup call for us. The threat to democracy in our times is not that great wealth under a so-called Anglo Saxon style capitalist economy such as ours and in the US is created. That in and of itself is not a bad thing; but that so much of that income and wealth is being concentrated in fewer and fewer hands. That is the pre-condition that can produce oligarchy. Our parents and grandparents knew what an oligarchic system of government looked and felt like, especially if they were black – as they lived under one. Thanks to the determination of previous generations to create a fairer and more accountable political and economic system, the modern middle class in Bermuda was built; one that benefitted all Bermudians. But those gains under the OBA are under threat in ways that we could scarcely imagine even five years ago. One cannot ignore the fact that the One Bermuda Alliance Government does represent the old status quo, characterized as it is by concentrated economic power in the hands of too few at the growing expense of the many. That model however, is not going to get us to where we need to be over the next five years and it will certainly not get us to 2025, with an economy or a country that we can be proud to hand over to our children.